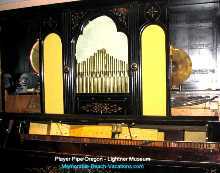 Why Oregon Coast & Beaches + Lighthouses? If you are up for an enjoyable, but long day, take a great Day Trip up to St. Augustine Florida. About 2 1/4 hours north of Cocoa Beach up I-95 - start out early because there is a lot to see once you get there - even some St. Augustine Florida beaches with interesting History! 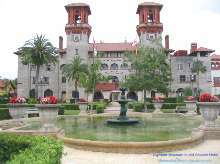 Tip Do NOT miss the Lightner Museum in the huge Historic Alcazar Hotel in St. Augustine! Opens at 9. Do this first so you won't run out of time - It is in itself worth the drive! and at 2 - the first "Juke boxes." Allow minimum of 3-4 hours - you will still want to go back and see the rest that you missed! Cafe Alcazar inside Museum on first floor is top rated and open Tues - Sat from 11:30 am - 3 pm. Click the "Visit the Museum" button to see a Beautiful picture of the Huge Alcazar Hotel Building, Fountain, and grounds. Can click the small Hotel Image to go to a Large View of the magnificent Hotel and fountain. (now the Lightner Museum) Open 7 days/week - 9-5. Adults (2005) $8 - Kids ages 12-18 - $2 - under 12 with adult free. Next "Must See" in St. Augustine is Castillo De San Marcos National Monument and Fort. Built 1672-95. Massive Interesting structure right at Ocean's edge. One of the most educational Florida St Augustine Attractions. The Spanish Fort is an important part of the St Augustine beaches history. It once was a part of the Defenses for the Spanish Treasure Fleets. Open 8:45 - 5:15 Adults- Age 16 & above (2005) $6 - Kids 15 & under free (ticket good for 7 days). Allow 1 1/2 - 2 hours. Tip Age 62 or Older? Use your Golden Age Passport and save 50% for you and your spouse - see our Discount Travels - age 50+ page for details. It is at the northeast end of the Old City across the street to the east of where you begin the Old City St. Augustine walking tour - (Hopefully you will have time to do at least parts of that.) There is a large parking lot adjacent to the Monument and Fort. Tip Return by way of A1A down to Palm Coast -then over to I-95. This route lets you drive the Ocean Front A1A Highway in an area where it runs by some beautiful homes and is very close to the Ocean for great Views. 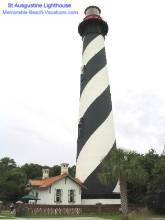 Historic St Augustine Lighthouse - 165 feet tall - great view at top! [Update - June 2 - 11, 2005 Vacation to St Augustine & Cocoa Beach] - We stayed one night at a Bed & Breakfast in the St Augustine Historic Old City and one in a hotel near the Beach before the start of our Sat. - Sat. week in oceanfront Timeshare at Cocoa Beach. Had more time to check out the many Florida St Augustine attractions and great oceanfront restaurants! See new additional St Augustine page posted - St. Augustine Florida Beaches & Attraction Pictures which has some of the pictures with comments & "reviews" - Also - St. Augustine FL Beaches Guide & St Augustine Campground & RV Park Guide + some new Cocoa Beach pages! Please send us any good Florida St Augustine Attractions and points of interest which you have discovered that are not mentioned here. Or send us your Comments on our Comments, Suggestions, & Favorites Page . Thanks! Take a fun cheap Florida - or wherever - US mini-Vacation. See the highly discounted Getaway Vacation Lodging Packages from $79 on our new Timeshare Vacation Promotions page - Many include free Attraction Tickets. Or see our Almost " Free " Time Share Vacations - Getaways with Time Share Resort Tour "price" page. St Augustine Florida Beaches & Attractions - Info and Tips + Pictures with comments & "reviews"
To St Augustine Campground & RV Park Guide - Info - Maps - Amenities. Looking for Something Specific? Search 2 of our now 4 US Vacation Guide Sites.